California based, yet Brooklyn inspired, Bed|Stu handcrafts the finest products in its footwear, belt and accessory collections. Founded in 1995, Bed|Stu has capitalized on a love for working with materials in nature and has used the inspiration of Bedford Stuyvesant, Brooklyn’s tough, resilient streets to design rugged, fierce and diverse pieces for an independent, liberated community of individuals. Each and every piece is embedded with Bed|Stu‘s theme of originality and autonomy that simultaneously is possessed by its proud and prideful wearer. Although the brand flourishes in its repertoire of various belts and accessories; the brand’s footwear is Bed|Stu‘s most prized possession that thrives. The Cobbler products mirror the people at Bed|Stu– raw, unique and broken in. The shoes are meticulously made one pair at a time, with the body and sole of each built with the technology to form to your foot shape. Slip them on and you will understand the meaning of custom footwear-these shoes are constructed to last not only a lifetime, but be handed down to generations of rightful heirs. The handmade vintage line of boots and shoes contain a cork layer between the insole and outsole that molds to the user’s feet. The organic shoe leathers are dyed using the original vegetable tanning process making for a slow and natural method of coloring that maintains the original, unaltered properties of the skin, ultimately enhancing its natural beauty. The Palazzo Brown Ponteggio Boot is a prime representation of the Cobbler collection with its lace-up closure, unique stitching, and brass stud detailing. The simple ankle design is eye catching, yet maintains a low profile while the foot embraces a flexible yet cushioned step. The Corsico Black & Brown/Rustic Bone Hand Washed shoe brings classic and modern elements to the table with its oxford-inspired shape, perforated wing-toe tip and heavily distressed & weathered feel for eye catching texture. The women’s Bristol Brown Oklahoma & Black Boot is 15 inches tall with a one inch heel and equipped with a thin, double wrapped strap around the ankle to provide durability while exuding femininity. A side zipper glazes the interior for a sleek fit, while the exterior is coated with a hand-washed finish polished by its time and wear. Like Cobbler, the signature Bed|Stu collection offers the same hand-made crafting, unique natural leathers, and intricate detailing inspired by the bench made footwear, but is available at a more attainable price. Authenticity is championed in Bed|Stu’s quality with its use of naturally tanned skins from across the world. The men’s Region Boot is the perfect go-to with its combined full grain leather in black with matching suede. Subtle slits lay between antique brass eyelets and a loop wraps around the back for a half laced laid back appeal, finished with metal studs for a jagged, yet current look. In addition to its Cobbler and Bed|Stu collections, Bed|Stu offers a limited edition capsule collection to support STAND UP TO CANCER.The company will donate $5 for each pair of shoes, and $3 for each belt sold from the collection from now until December 31, 2013. Bed|Stu is proud to support the organization as it aims to fund collaborative, translational cancer research to bring treatments to patients and save lives; http://www.bedstu.com. Since STAND UP TO CANCER was founded in May 2008, the organization has granted over 109 Million Dollars to eight Dream Teams of scientists and researchers, as well as to 26 high-risk, high-reward Innovative Research Grants.100% of public funds go directly into research grants and a portion of the funds that are raised from major donations and third-party fundraising go towards administrative expenses and overhead; http://www.standuptocancer.org. From now until December 31, 2013, Bed Stu proudly supports Stand Up To Cancer through its special collection of shoes and belts. Bed Stu will donate $5 for each pair of shoes and $3 for each belt available at participating retailers. Bed Stu has made a minimum guaranteed donation of $10,000. SU2C is a program of the Entertainment Industry Foundation, a 501(c)(3) charitable organization. 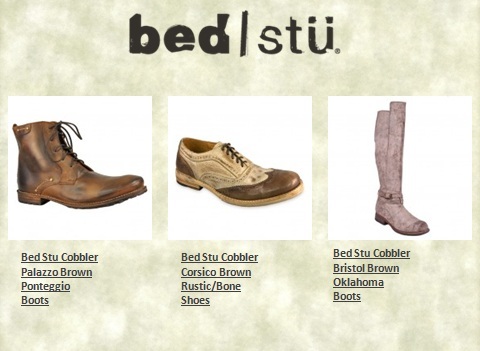 This entry was posted in Shoes and tagged bed stu, Bed|Stu, footwear brand, Sole to Soul. Bookmark the permalink.